The dish presented here is true blue Punjabi household recipe especially made on Ashtami, eighth day of Navrati festival where Goddess Durga is worshipped. Families fast for seven days and on the eight day morning, prayers are offered and the fasting ends by offering the Goddess with Sooji Halwa, Chana and Poori. Wikipedia mentions that Navratri is a festival dedicated to the worship of the Hindu deity Durga. The word Navaratri literally means nine nights in Sanskrit, nava meaning nine and ratri meaning nights. 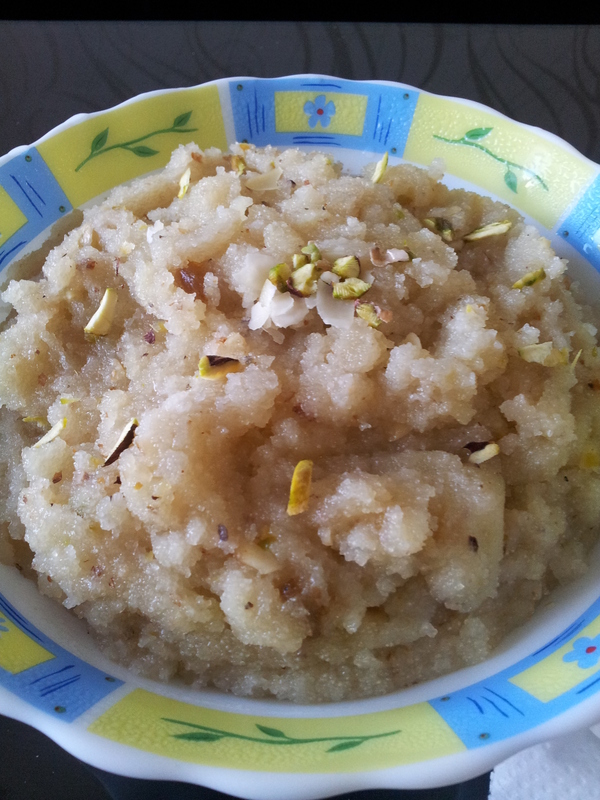 Apart from the festivities, Halwa is relished by Punjabi households along with Namak Ajwain Paratha (Indian flatbread rolled with clarified butter and seasoned with salt and carom seeds) and Aloo Jeera (Potatoes cooked with cumin seeds and dry masalas) as breakfast. It is a wholesome meal in itself. Now this actually amounts to having breakfast like a king. In a non-stick pan, dry roast semolina for 2 minutes on low heat until it acquires a pale golden color. Please ensure that you keep stirring the semolina so that it does not get burnt or a brown color. In a saucepan, heat water on medium heat and add sugar and crushed cardamoms. Adding the elaichi to the sugar syrup makes it fragrant and allows the sugar to blend in the cardamom flavors. It remains subtle yet present in every morsel. Now in a Kadai (thick bottom wok) on low heat, take the clarified butter and add the roasted semolina to it. 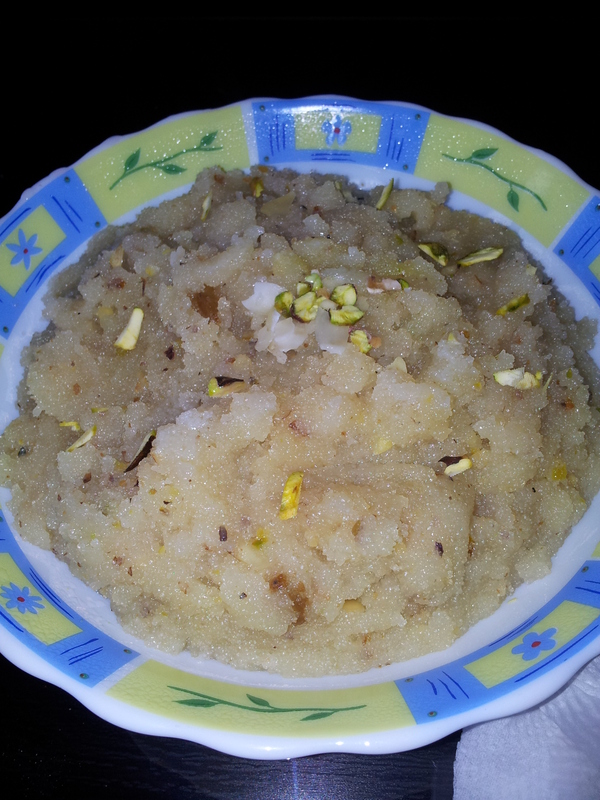 Keep cooking the semolina in the ghee until it have a golden color. Keep stirring it continuously, it usually is good after 7-10 minutes. Add the crushed nuts, to give a good body to the halwa. Ensure that you crush the nuts in a traditional motor and pestle. Add the sugar syrup to the mixture. Be careful with this step and ensure that the burner is on low heat since the syrup will start to bubble and will sprinkle all over. Another 5 mins and Voila!! your yummy treat is ready to be served to a hungary lot or to simply please the deities. We had a South Indian family as our close family friend, they used to soak saffron strands to 2 tsp of warm milk and once the saffron flavor was dissolved, it was added along with the sugar syrup to the semolina. It is a popular dish from South India known as ‘Rava Kesari’. I intend to cover it here sometime soon.